In yesterday's segment we used Emporer Babur's destruction of Ram Janmabhoomi, Lord Rama's temple at Ayodha, as an example of the long-term effects of the Mughal destruction of Hindu temples. Ayodhya certainly stands as one of the most grievous acts of temple destruction, but there many others of great importance, for example, the destruction of Sri Krsna's temples in Mathura, and Shankar's temple at Benaras. While there is plenty of disagreement today between Muslims and Hindus about how many temples were actually destroyed during the Mughal era, there is also a surprising amount of historical evidence in this regard. The Muslims were known to keep very detailed records of their conquests, and the destruction of Hindu temples and the kufr (the unholy) who populated them was seen as a great act of piety, an offering to Allah in the mood of Muhammad himself. With respect to the destruction of Ram Janmabhoomi, there are numerous historical records of the desecration of the temple complex, including the Janmasthan of Sri Rama at Kot Ram Chander, the private apartments (mahal sarai) of King Dasaratha and Lord Rama, and the Sita Ki Rasoi, or Sita's kitchen. All these structures were destroyed by Babur's forces in 1528 A.D., as described yesterday. We have also previously mentioned the granddaughter of Emperor Aurangzeb, the princess Gul-Badan Begam, who wrote the Humayun-Nama in which she documented various aspects of the Mughal assaults. In fact, many of the Muslim writers who preserved this history lived at Ayodhya (Awadh), and they wrote about the nearly 80 different efforts made by the Hindus to take back control of Rama's holy dhama. These records state that more than 100,000 Hindus died trying to take back Lord Rama's temple. In the late 16th century, Abul Fazl, the author of Akbar-Nama, wrote about the fact that even after the Muslim occupation, large celebrations of Rama Navami still took place at Ayodhya. "... the mosques built on the basis of the king's orders (ba farman-i Badshahi) have not been exempted from the offering of the namaz and the reading of the Khutba [therein]. The places of worship of the Hindus situated at Mathura, Banaras and Awadh, etc., in which the Hindus (kufar) have great faith - the place of the birthplace of Kanhaiya, the place of Rasoi Sita, the place of Hanuman, who, according to the Hindus, was seated by Ram Chandra over there after the conquest of Lanka - were all demolished for the strength of Islam, and at all these places mosques have been constructed. These mosques have not been exempted from juma and jamiat (Friday prayers). Rather it is obligatory that no idol worship should be performed over there and the sound of the conch shell should not reach the ear of the Muslims..."
"The past Sultans encouraged the propagation and glorification of Islam and crushed the forces of the unbelievers (kufar), the Hindus. Similarly, Faizabad and Awadh (Ayodhya) were also purged of this mean practice [of kufr]. This [Awadh] was a great worshipping centre and the capital of [the kingdom of] Rama's father. Where there was a large temple, a big mosque was constructed and where there was a small mandaf, there a small kanati masjid was constructed. The temple of Janmasthan was the original birthplace (masqat) of Ram, adjacent to which is Sita Ki Rasoi, Sita being the name of his wife. Hence at that site, a lofty (sarbaland) mosque has been built by Babar Badshah under the guidance of Musa Ashikan... That mosque is till date popularly known as Sita Ki Rasoi..."
"The theme of the iconoclast Muslim Sultan is routinely put to use for political mobilization by communal forces, as so tragically illustrated in the case of the Babri Masjid controversy, resulting in the deaths of thousands of people. Not content with that, Hindutva forces are on record as declaring that they aim at destroying or capturing some 30,000 mosques and Muslim shrines, which, they claim, were built on the sites of Hindu temples allegedly destroyed by Muslim rulers. Hindutva literature is replete with exhortations to Hindus to avenge the misdeeds, both real and imaginary, of medieval Muslim kings, including destruction of temples. This propaganda and the communal mobilization that it has provoked have resulted in a sharp deterioration of inter-communal relations in recent years. 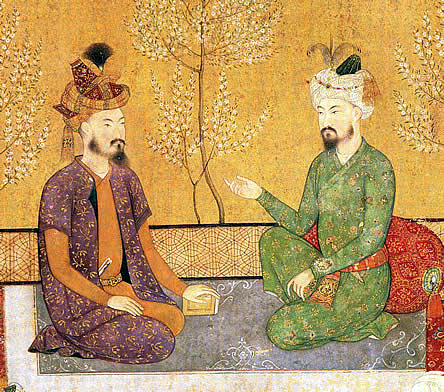 The notion of the Muslim Sultan as temple-breaker, Eaton says, derives essentially from history texts written by British colonial administrators, who, in turn, drew upon Persian chronicles by Muslim historians attached to the courts of various Indian Muslim rulers. Eaton argues that British colonial historians were at pains to project the image of Muslim rulers as wholly oppressive and anti-Hindu, in order to present British rule as enlightened and civilized and thereby enlist Hindu support. For this they carefully selected from the earlier Persian chronicles those reports that glorified various Muslim Sultans as destroyers of temples and presented these as proof that Hindus and Muslims could not possibly live peacefully with each other without the presence of the British to rule over them to prevent them from massacring each other. Although some of these reports quoted in British texts were true, many others were simply the figment of the imagination of court chroniclers anxious to present their royal patrons as great champions of Islamic orthodoxy even if in actual fact these rulers were lax Muslims." Readers are encouraged to accept Eton's findings in the book, in part on the basis that some of the temple destructions were not inspired by religious hatred, but rather were simply motivated by the desire to loot riches -- gold, jewelry and temple valuables. This, of course, gives little comfort to the spiritual descendents of those temple congregations, and is an unconvincing argument for downplaying the importance of events.